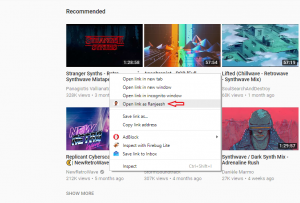 Google’s Chrome Browser has this cool feature, which a lot of people do not know, where you can maintain different profiles with different set of bookmarks, themes, history and all other chrome features. You can either use your different gmail addresses to create the profiles or you can use it without associating with a gmail account. If you are familiar with this “add person” / “manage people” feature on the Chrome browser , you will appreciate the “Open link as [person]” context menu item that seems to have been implemented recently. This is very helpful when you want to keep specific type of content on specific profile on chrome. For example, If you have a profile [chrome person] for all your personal accounts like facebook and another profile [chrome person] for work, you would some times want to share a link from your work profile on the personal profile. So instead of going through the process of opening another browser on the other profile and then copying pasting the link from one profile browser to another you can just open in another profile using this link. This was a new discovery for me today and will be using it a lot now on. If you are not familiar with the “add person” profile feature on chrome you should start using it soon! It helps you keep work and personal stuff seperate.